The Plaza Super Cinema was opened on the 6th of October 1932, having been commissioned by the Read, Snape and Ward Cinema Circuit. The architectural design by the Manchester firm of Drury and Gomersall closely followed the earlier Regal Super Cinema in Altrincham also constructed for the same circuit. Unusually, Drury and Gomersall could not be credited with the scheme, which went to the Lancashire architect William Thornley who adapted the Regal Altrincham designs for the more restrictive Mersey Square site. The Plaza is an architectural gem. It is a unique Grade II* Listed building that has survived almost intact. It is now nationally recognised as the best surviving example of a 1930’s Super Cinema in the north of England. The cinema held almost 1,800 patrons on circle and stalls levels and was lavishly appointed in the neo-classical style with reflective paint finishes and a three coloured lighting system which allowed the auditorium to be ‘light painted’ in any colour or hue. The interior is 1930’s Art Deco with 95% of the theatre lighting concealed. Much of the decor reflects an Egyptian theme which was in vogue at the time of its construction. A café restaurant seating 90 diners was incorporated at first floor level, and stage facilities were provided for cine-variety performances. One of the greatest assets of Plaza is its Compton Organ organ, which has survived intact and in full working order. 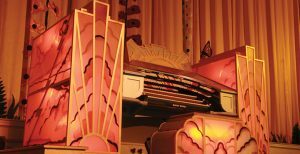 It was built to the designs of Norman Cocker (of Tuba Tune fame), Arthur Ward and John Compton was provisioned and incorporated the very first illuminated ‘glazed sunburst’ console surround to be installed with an organ in the UK. Two pipe chambers (A and B) are located one above the other in the right hand anti-proscenium splay wall containing 11 ranks of pipework with an adjacent blower room. The Plaza operated successfully as a cinema until the mid 1960’s when Mecca purchased the building through a shares deal, and both operated and maintained the building to the highest standards for the next three decades, regularly hosting the very popular Theatre Organ Club Sunday concerts. In 1998 the bingo operation ceased, and after a productive campaign to save the building for appropriate use, Stockport Plaza Trust bought the Plaza with a grant from Stockport Council. The volunteer run trust operates a successful mix of Cinema and Theatre performances often preluded with the Compton organ. In 2009 after the award of substantial grants from the HLF and NWDA, the Plaza was fully restored to opening condition at a cost of approximately £4m. In 2014, the Compton organ was fully refurbished by the Jardine Organ Company, and the illuminated console restored to new condition.